Part 90: Baruch. According to the first century, Roman-employed Jewish historian, Flavius Josephus, Baruch ben Neriah (which translates to Barcuh, son of Neriah) was a Jewish aristocrat. An aristocrat is a person who is in the upper class of society. Baruch’s brother, Sereiah ben Neriah, was chamberlain (or household manager) of King Zedekiah. With that said, Baruch is not known for those things; rather, he is known for his role as a scribe and, specifically, as an assistant of Jeremiah’s. He is known for writing down the first and second editions of the prophecies of the great prophet. He was also known to be an unwavering disciple and supporter of Jeremiah’s. In fact, while Jeremiah was in hiding for his life, he commanded Baruch to read his prophecies against King Jehoakim to the people who were assembled in the Temple in Jerusalem. Baruch carried that order out unflinchingly, despite the great difficulty and danger it presented him. We don’t garner too much about the life of Baruch from the Bible, other than his being a protégé, a scribe, and a close friend of Jeremiah’s. We don’t know how he experienced his call, how he struggled with it, or how he came to accept. All we know is that he did, with little to know information of what happened leading up to his acceptance. With that said, we can certainly use our imagination and piece the puzzle together from what we have learned of him. Coming from an aristocratic Jewish family we know that Baruch and his family were privileged. They enjoyed high societal status and all of the privileges/benefits that went along with that. Baruch was clearly well-educated, which can be ascertained by his role as as scribe (some one who can read, write, and interpret the Scripture). Yet, Baruch did something that must not have sat well with at least some in his family. He became a student of a prophet who was speaking out against the aristocracy and nobility of Jerusalem. He joined forces with a prophet who was calling out King Zedekiah, whom his brother was serving as the household manager. How did his role as scribe sit with his brother or his father? Was he an embarrassment to them, did he bring shame to the family name? While we’ll never be able to know the answer to those questions, we can safely presume that answering the call to prophetic ministry cost Baruch something and that he must have wrestled with it before making the decision. The reality is that, like Baruch, we are all called by God to stand up against societal, governmental, and systemic injustices. We are all called to push back against the status quo. It is also true that we either ignore the call altogether, or we acknowledge it we find ourselves wrestling with the it. How can we not? To answer God’s call is costly. It can cost us our status, our privilege, our reputations, our friends, our family, and even our lives. Yet, God is calling…ever calling. The challenge for us is to acknowledge our call, to wrestle with it, and to accept it “unflinchingly” just like Baruch did. It is then that we will see God work through us in ways we never knew possible. The willingness to wrestle with and accept God’s call leads to the transformtion of self and of community. Lord, what is it that you are calling me to do. Illumine me, give me clarity, so that I may answer that call. Amen. Easter Sunday. He is risen! In Isaiah 53:7-12, the prophet talks about God’s suffering servant. He mentions that the holy sufferer will see what was accomplished as a result of his suffering and be satisified. The sufferer will know that the suffering had not been in vain; rather, he sees that his suffering has brought redemption to many. Many, as a result of him bearing the sins of the world, will find salvation. Isaiah continued on to proclaim, “I will give him the honors of a victorious soldier, because he exposed himself to death. He was counted among the rebels. He bore the sins of many and interceded for rebels” (vs. 12). Thus, the suffering servant suffered death but was honored like a victorious soldier. Isaiah, when writing this, may have seen himself as the suffering servant. He may have seen Israel as a whole as the suffering servant, and that Israel was bearing witness of their faith in God to a hostile world. The neat thing about prophecy is that that, regardless of the original context, a prophecy comes from God and the visions revealed in them prove themselves true in ways we could have never expected. Even if Isaiah had Israel in mind as the suffering servant, the way this prophecy got fulfilled in Jesus Christ is beyond human comprehension. It is the power of God on full display for all the world! Surely, Jesus came from Israel and through Jesus (the righteous suffering servant), many found redemption from their sins. How awesome is our God! Daniel also prophesied about the Son of Man, and the glorious victory he would have over the sinful world. In verse 17, he enters onto the scene in glory, in the very presence of the living God. Furthermore, in verse 26, Daniel wrote, “Then the sovereignty, power, and greatness of all the kingdoms under heaven will be given to the holy people of the Most High. His kingdom will last forever, and all rulers will serve and obey him” (Daniel‬ ‭7:27‬ ‭NLT‬‬). In other words, the Son of Man (aka Jesus Christ) has established God’s Kingdom on earth and that all the kindoms of the earth will be given over to God’s people who serve and obey the soveriegn God. Daniel’s verse is often seen as a prophecy for the future, for the second coming of Christ. While the future has yet to be revealed, it certainly makes sense being that the world has yet to be fully delivered from sin and evil. It is easy to understand that this prophecy could still have more unveiling to do; however, prophecy is the gift that keeps on giving and, while more may be fulfilled in this prophecy, it is also true that it has already seen fulfillment in the resurrection of Jesus Christ. Let me explain. Forty days after resurrecting and showing himself to countless people, Jesus ascends (coming on the clouds) into heaven and is “led into [the] presence “of the “Ancient One”. What happened from there? Jesus sent the Holy Spirit, which outpoured onto the disciples, filling them with God’s Spirit and power. From the day of Pentecost and onward, the disciples healed the sick, took care of the poor, visited the imprisoned, raised the dead to life and preached the Good News of Jesus Christ to all of the known world. Within 400 short years, this little sect of Judaism overtook the Roman Empire, the very empire that executed Jesus and his followers. Holy wow!!! Think about that. The impossible was made possible as a result of Jesus’ resurrection! Praise God! 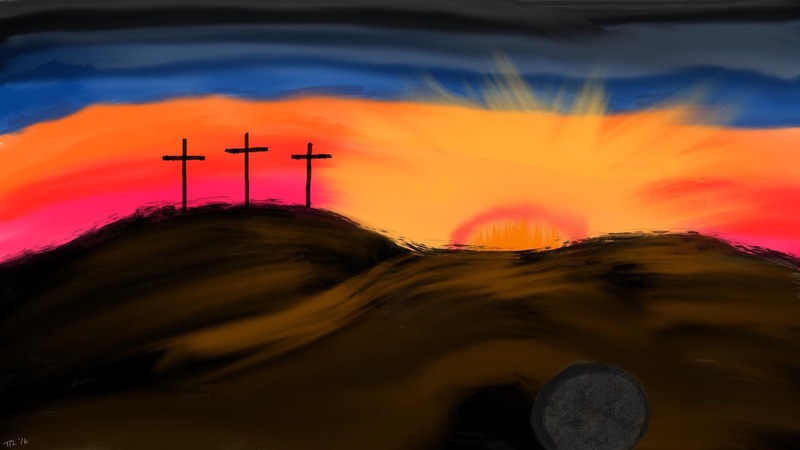 Certainly, the resurrection was not the end of the story, but the beginning of it. Christians, being human beings, have fallen short and have sometimes put the institution of Christianity above Christ; however, Christ is still unfolding the salvation, redemption and sancitification of this world. What’s more, we are a part of that unfolding! We are a part of the story. We are the ones who, if we are faithful, will do even greater things than that of the disciples if we would only open our hearts to the possibility and to the call. With that said, happy Easter! He is risen! Now, rise up and preach the good news of Jesus Christ to all the world! He is risen and you can rise with him! Lord, you have redeemed me and I choose to live the RESURRECTED LIFE in you! Amen. There is nothing like a political campaign season to bring out the ugliness in people. One cannot go online without being barraged by people on all sides of any political divide, smearing everyone who thinks and views things differently than them. In this particular “Election 2016” cycle, things have descended to uncharted lows. What’s more, the divide is not solely political either. There is a huge divide in terms of religion as well. Of course, religion has always been a divisive topic among Christians and other religious groups. There’s divisiveness within a religion, where people of the same religion are divided over doctrines, dogmas, and other such things. There’s also divisiveness between different religions as each fight to compete in whose religion holds the absolute truth. In America, and in Western Civilization as a whole, people have become less willing to share their faith because they have come to see faith and religious believes as something that is personal and something that is to be private. What’s more, people have also come to believe that faith should not interfere with politics and vice versa. There is a whole history in Western Civilization that informs us on the dangers of religion and politics mixing. Even families are guarded against discussing the two, as the phrase goes, at the “dinner table” because they can often bring about heated and divisive arguments. While this is often true and the mixture of politics with religion can be quite toxic and devastating, this has also led America and the Western world to a skewed and incorrect understanding of the role of religion in society. As we saw in the devotion series I wrote on the wrath of God, religion and politics are not mutually exclusive. The prophet is one who is called to speak out against injustice, against sin, against systemic evil and the societal abandonment of God. In order for the prophet to fulfill her/his role, she or he must speak out against the ills that are plaguing society. Not just moral ills and not just social ills…but all ills. Prophets speak truth to power and, by doing so, push for societal/social/religious change. The prophet’s words are never “politically correct”, nor are they ever politically wanted. As a result, prophets often pay high social, political, and sometimes religious costs for daring to speak God’s word to the people. What’s important to note here is that, while the prophet is not called to politicize God or Scripture, she or he’s message will inevitably have political effects and ramifications. By remaining silent and refusing to let God speak through us, we silence our prophetic voice and choose to remain complicit in the way of the world. The prophet is one who recognizes God is calling us to speak truth to power, to stand up against injustice and to push for the changing of the hearts of God’s people. The question for us is, what is holding us back from being such a prophet? What is keeping us from speaking truth to power and standing up for what’s right? What is stopping us from choosing to not hide our faith away like some sort of “best kept secret”? What is stopping us from keeping our religion in the proverbial broom closet? Are we ashamed of our faith? Are we afraid of the consequences and of what others might think? Let us not shy away from our obligation to speak the truth and stand up for what is right. It may have political consequences, but far better that than the spiritual consequences of remaining silent through, complicit in and culpable for, the evil around us. Lord, help me to speak the truth at all costs and steer me from turning a blind eye to the injustice in the world. Amen.